The partition of Ireland refers to the division of Ireland into two parts: one a self-governing state and one a member state of Great Britain. This occurred in 1920, after years of lobbying for Home Rule and debate over how Ireland should be organised and governed. In December 1920, almost two years into the Irish War of Independence, the British parliament passed the Government of Ireland Act. This legislation introduced Home Rule and formalised the partition of Ireland. Home Rule was welcomed by moderate Irish Nationalists, who sought the restoration of self-government in Ireland. Home Rule did not go far enough for more radical Republicans, however, who wanted independence and freedom from British sovereignty. Opposition to Home Rule was also strong in Ulster, particularly its six north-eastern counties. Protestant Unionists in these counties refused to be governed by a Nationalist parliament in Dublin; they feared a new Catholic ascendancy where Protestants would be marginalised, discriminated against and possibly persecuted. Opposition to Home Rule intensified in the years before World War I. When the British parliament began debating the third Home Rule Bill in 1912, Ulster Unionists threatened to take up arms rather than submit to government from Dublin. They began forming and training paramilitary groups like the Ulster Volunteers – and in March 1914 they imported 25,000 rifles, purchased from German arms brokers. Nationalists responded by forming their own paramilitary group, the Irish Volunteers, to protect the new government from a Loyalist uprising. 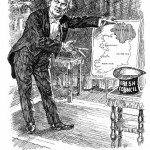 The introduction of Home Rule, it seemed, might tip Ireland into a state of civil war. The final Home Rule Act, passed in September 1914, included a safety valve. Under its terms, the six Loyalist-dominated counties in Ulster were to remain under British rule for a further six years. The implementation of Home Rule was suspended due to the outbreak of World War I. The tensions in Ireland were deferred, though not eased. When Loyalist and Nationalist politicians gathered in Dublin in 1917-18 to discuss Home Rule and the future of Irish government, the old divisions surfaced again. 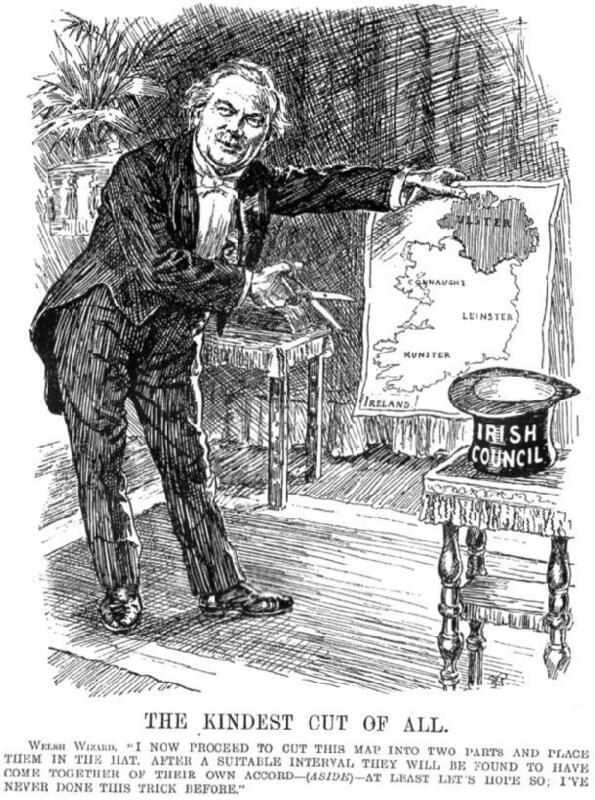 In December 1920 Britain passed the fourth Home Rule Bill, formally titled the Government of Ireland Act. This legislation divided Ireland into two constituent parts: Southern Ireland (26 counties) and Northern Ireland (six counties). Both regions would be self-governing dominions of Great Britain, London retaining control of significant policy areas like defence, currency, foreign affairs and trade. Partition was a both a compromise and an expediency. It was intended to implement Home Rule without inciting well armed Loyalist paramilitary groups in Ulster. It was considered a temporary measure: the terms of the act provided for cooperation, unity and, in time, reunification. The partition of Ireland incited division and controversy, even as it was being debated and finalised by Westminster. Some politicians supported partition as a way of resolving Ireland’s sectarian crisis. Others criticised partition for its expediency or unworkability. British cabinet minister Austen Chamberlain condemned it as “a compromise – and like all compromises, it is illogical and indefensible”. Partition was implemented but the reunification of Ireland soon became a pipe dream. The events of the 1920s only hardened the borders and widened the gulf between North and South. Partition was rejected by radical Republicans like Sinn Fein and the Irish Republican Army (IRA), which vowed to continue its campaign of violence against British rule. The ongoing Irish War of Independence ensured that Home Rule was never implemented in the South. The Home Rule Act ordered the formation of a new political entity called Southern Ireland; it would have its own parliament, executive government and judiciary. But the disruption of the war and opposition from Sinn Fein and other Republicans meant this parliament never prepared or passed legislation. Another creation of the Home Rule Act, the Council of Ireland – a joint committee to allow cooperation between Dublin and Belfast – also never saw the light of day. Home Rule was accepted and implemented by the Unionists in Northern Ireland. In the South, however, Home Rule died on the vine, disregarded and sabotaged by Nationalists. In July 1921 the British government, eager to end the violence in southern Ireland, offered the Nationalists a truce. 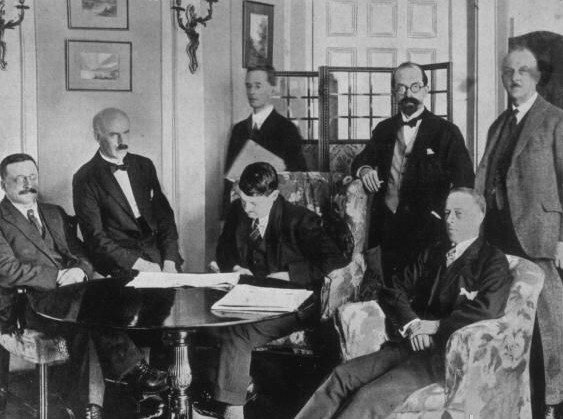 A Nationalist delegation, headed by Dail Eireann member Arthur Griffith and IRA commander Michael Collins, travelled to London to negotiate a treaty. The president of the self-declared Irish republic, Eamon de Valera, did not attend but provided the delegation with instructions. 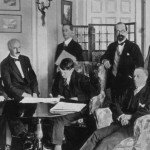 On December 6th 1921 Griffith, Collins and the other delegates signed the Anglo-Irish Treaty. This agreement created an Irish Free State in the south. It also gave the six Ulster counties an option to withdraw from the treaty. But while the Irish Free State now legally existed, it drove a wedge between Ireland’s Nationalists. Republicans like Eamon de Valera viewed the Treaty as a betrayal, a failure to liberate and unify all the people of Ireland. Michael Collins, in contrast, considered it the first of several steps towards achieving that goal. When the Treaty was presented to the Dail Eireann it sparked heated debates and triggered a split in the Nationalist movement. 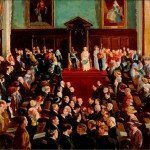 The Dail narrowly ratified the Anglo-Irish Treaty, 64 votes to 57, and set about forming a new Provisional Government of Ireland. Infuriated, de Valera resigned as president. De Valera vowed to “continue to deny the right of any foreign authority in Ireland [or] admit that our country may be carved up by such an authority.” Debates over the Treaty also prompted a split in both Sinn Fein and the IRA. On April 14th 1922 around 200 members of the anti-treaty IRA occupied Four Courts in Dublin, hoping to incite a confrontation with Britain that might reunite Irish Nationalist forces. Collins, however, refused to order any military action against the protestors. The standoff lasted for ten weeks until Collins, under pressure from London, bombarded the courts with artillery. The IRA men surrendered after two days. This incident triggered fighting between anti-treaty and pro-treaty forces across Ireland. This conflict, known as the Irish Civil War, would last for ten months. The IRA launched a campaign of guerrilla warfare against Free State troops. By late 1922 it was obvious that the anti-treaty movement would not win the conflict. In August Michael Collins himself died at the hands of anti-Treaty assassins when his car was ambushed and sprayed with gunfire in County Cork. In January 1923 the Free State executed more than 30 anti-Treaty IRA. The capture or killing of IRA leaders like Todd Andrews, Frank Barrett and Liam Lynch all demoralised anti-Treaty forces and led to a ceasefire on April 30th 1923. Events across the border in Northern Ireland also contributed to the permanency of partition. 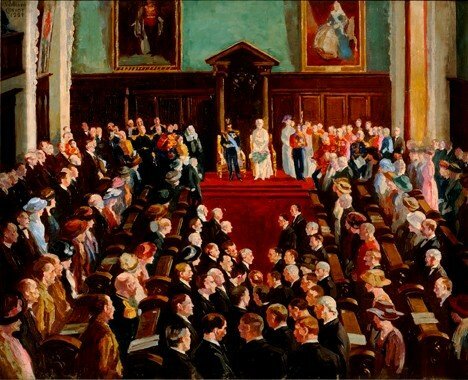 The Northern Ireland parliament was convened for the first time in June 1921. It was opened by King George V, who delivered a stirring appeal for reconciliation between London, Belfast and Dublin. James Craig, a Belfast-born Protestant and member of the Orange Order, became the first prime minister of Northern Ireland. Craig’s Unionist-dominated government was confronted with many problems of its own. Uncertain financial allocations from Westminster meant the Northern Ireland government was always short of cash, while the collapse of industries in Belfast and Derry pushed Northern Ireland’s unemployment up to almost 20 per cent. The Six Counties also had to contend with rising sectarian violence, fuelled to a large degree by the civil war in southern Ireland. Rioting in Belfast in 1920-22 killed more than 450 people, while more than 20,000 Catholics were forced from their homes. 1. The partition of Ireland divided Ireland into two parts: Southern Ireland or the Irish Free State, and Northern Ireland. It was devised by the British government and finalised in December 1920. 2. 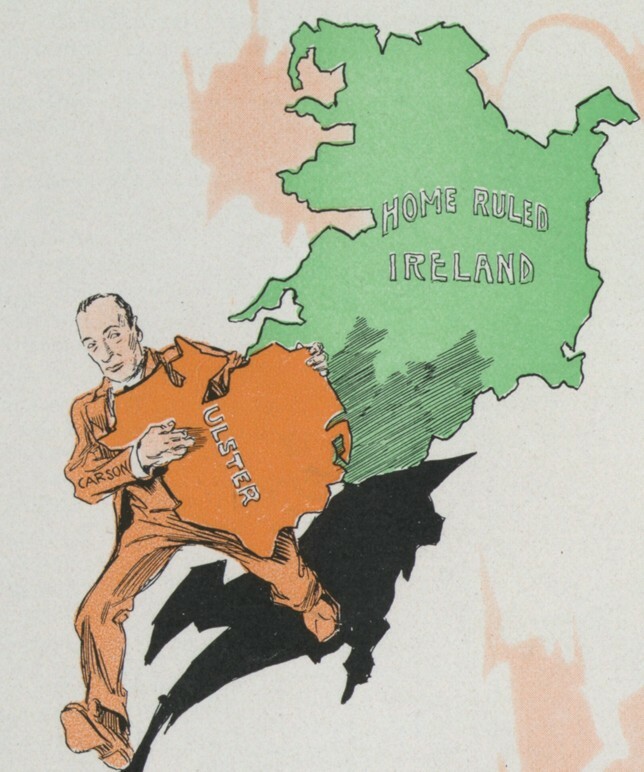 Partition was intended to achieve the peaceful implementation of Home Rule in Ireland. Armed Unionist paramilitaries in Ulster were threatening to resist a government based in Dublin. 3. The partition created two self-governing dominions: Northern (six counties) and Southern (26 counties) Ireland. It was intended to be temporary, allowing for a future reunification of Ireland. 4. The Anglo-Irish Treaty, the Irish War of Independence and the Irish Civil War only hardened partition and contributed to the separate development of Northern Ireland and the South. 5. 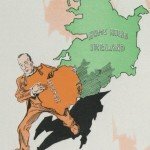 When Southern Ireland re-formed as the Irish Free State in December 1922, the Northern Ireland government exercised its right to separate from Dublin under the Anglo-Irish Treaty.